Jimmy watches people with curiosity in his golden eyes. 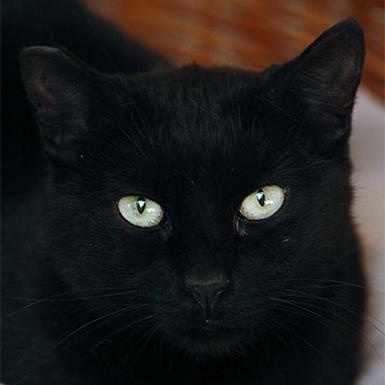 This handsome black cat with lustrous fur wants your attention; he's just a little too shy to ask for it quite yet. A healthy cat with a good appetite, Jimmy especially loves treats. In a home with a cat savvy person, treats might be just the ticket to help him overcome his shyness. Jimmy gets along fine with other cats and finds comfort in their company. Born in 2003, he came to the Sanctuary after his person passed away.Could you be the one to change the look in Jimmy's eyes from curiosity to love? He sure hopes you'll give it (and him) a try!